Bohemian-born Bohumir Kryl made sounds with the cornet that audiences had never heard before and that no one had dared to try to record until he came along. He had the outsized ego to make sure he would not soon be forgotten, making his interpretations of the classic repertoire into standards along the way. World-Famous Wizard of the Cornet features 28 selections, recorded between 1901 and 1918, that showcase Kryl's unique technical gifts. A 32-page full-color booklet is included that tells Kryl's life story from his earliest days as a circus acrobat and sculptor. A must-have for musicians. 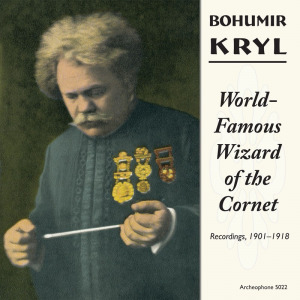 Visit World-Famous Wizard of the Cornet's expanded catalogue page to see the complete track listing, read an extended description, and listen to sound samples.